The TZTL12F from Furuno is their first all in one, combination chartplotter/fishfinder that can be networked either via NMEA 2000 and CanBUS. A 12.1” glass, edge to edge touch screen on the TZT12 provides the user with an elegant appearing display that is not only easy to operate but easy to install. With “Edge Swipe” accessing different displays has never been easier. 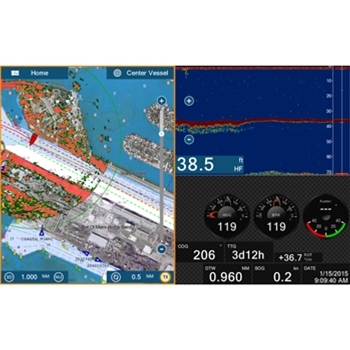 Swiping from the left edge reveals the NavData panel, Swiping up from the bottom of the screen unveils the new Layers menu and swiping from the top or right side of the screen provides additional TZTouch Functions. Built with an internal 56 channel GPS/WAAS receiver that acquires satellites in almost any position or location on the boat, the TZ Touch 2 eliminates the need to mount an external antenna and run cables to connect the two. 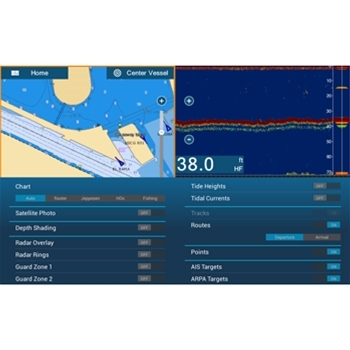 The TZTL12F is a combination GPS/Fishfinder that offers the fisherman a dual frequency 600W or 1kW sounder that possesses Furuno proprietary Fish Finder technology, called RezBoost. RezBoost is a revolutionary feature that utilizes Furuno’s exclusive digital signal processing protocol to produce fantastic target resolution and separation, without the need to change out your transducer, or purchase expensive broadband transducers. Of course the internal fishfinder of the TZTL12F has the same Bottom Discrimination and AccuFish Modes that Furuno users have become accustomed to seeing but with the target separation that previously, only their commercial grade fishfinder could display. Offering a huge memory for storing waypoints, tracks, and routes with up to 30,000 waypoints, 30,000 track points, and 200 routes with up to 500 points each the TZTouch 2 is network capable allowing you to add AIS, Radar, XM Weather, Thermal Imaging and so much more. 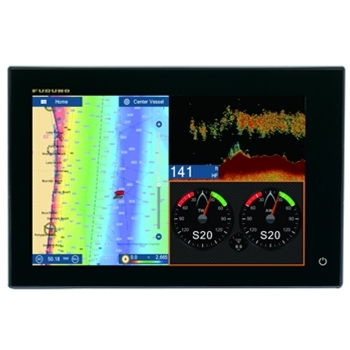 If you are in the market for the best looking, easiest to operate and install, and possibly the best performing combination chartplotter/fishfinder the TZTL12F from Furuno will provide you with all you are looking for. Each Furuno 12" TZTouch2 comes with:12" Furuno TZTouch2, Power Cable, Soft Protective Cover,LCD Cleaning Cloth, Flush Mount Sponge and Template, User Manual and CD and a Two-Year Warranty.